Earlier this year when the Supreme Spring/Summer 2017 preview dropped, to the surprise of many, the cult brand Supreme previewed two Artek chairs (the Alvar Aalto Stool 60 and the Bench 153). This interested both design and streetwear enthusiasts around the world and many Finns felt pride through the Finnish brand Artek for being recognised on the biggest stage of international streetwear. 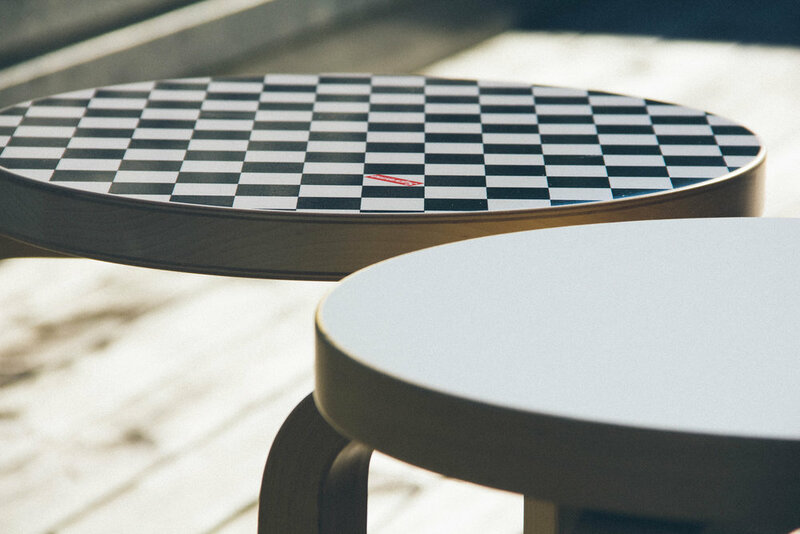 The two collaborative products by Supreme and Artek are the Alvar Aalto Stool 60 and the Bench 153, both sporting the well-known Supreme-designed checker pattern. What makes these chairs special is that they consist of uniquely bent Birch wood legs and manually-applied silk screen printing. Essentially, every chair is handmade from start to finish. We managed to grab of one of these chairs, the Stool 60, and it is stunning in person. The stool retailed for 298€ plus shipping from Supreme (in comparison, a normal Artek Stool 60 retails for around 240€). The craftsmanship and attention to detail is exactly what you would expect from Artek. Comparing the Supreme stool to a nearly identical Artek stool, the Supreme stool consists of lighter birch wood, which gives it a cleaner look. Assembly was extremely simple and painless; three screws through three legs and the stool was complete. The initial hype for the collaboration was huge, but it divided opinions. Some labeled it a lazy design and some thought it was genius. However, when the collection dropped both items sat in the Supreme online store and appeared almost forgotten. Neither product actually sold-out in typical Supreme fashion, but is selling out a measure of success? For me it isn’t, but for many it is. Now that the collection is no longer available it is safe to say that the rebel brand may never cross paths with Artek again. Will the collaboration be forgotten or will they become extremely collectible? Only time will tell.